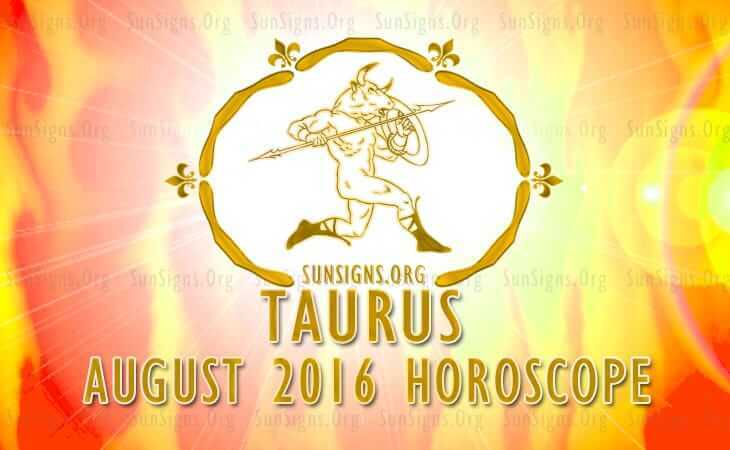 August 2016 Horoscope for the Taurus zodiac sign predicts that the house of family is more powerful than house of career. Domestic issues and emotional matters will be in the focus. You can sort out problems on the home front and take steps to enhance your psychological strength. Other people and their interests are more important than personal ambitions for the bulls in August 2016. You have to adapt yourself to the way things are happening and reduce your self-exertion. Social grace will be important to achieve your objectives and personal effort may be restricted to the minimum. Taureans can indulge in renovation and beautification of the house and in socializing with friends and social contacts in August 2016. Your Karmic lessons from the past can be used as guidance for the actions to be taken in the near future. The Taurus 2016 monthly zodiac predictions suggest that planets are not favorable for career or business growth this month. So relax and concentrate on planning for future prospects. The Taurus earnings will be very good in August 2016. Jupiter has a beneficial impact on your finances. Your spouse will be financially successful and will be able to assist your monetary efforts. You are able to raise capital for your projects easily. Money will have to be spent on the family after the 11th. After that there is a danger of expenses overrunning your income. Speculative investments will yield good returns. Wealth comes from profession and insurance. Love is turbulent this month for the Taurus birthdays. Current relationships will face challenging times. Good relationships will survive while the weaker ones may fall apart. This is an excellent time for singles to flirt and have fun which may even lead to sexually passionate one night stands. The moon phases will help you overcoming infertility or pregnancy issues. If you are engaged in philanthropic activities, there may be problems during the end of the month. Religious beliefs and organizations to which you belong will see drastic transformations. The Taurus 2016 August forecasts suggest that you should take sufficient rest till the 23rd as health will be fragile. You should take care of your emotional fitness to enhance your physical well-being. Taking interest in your hobbies and creative talents will boost your health enormously and will keep you in good spirits. Spirituality and religious activities will divert your attention from professional stress and will help you in improving your physical health. Be sure not to fall sick with an upset stomach. To conclude, the Taurus August 2016 horoscope warns you of a slow month on the career front and to be careful of digestive disorders.